Work YOUR Vision - Your Daily Cup of Inspiration! 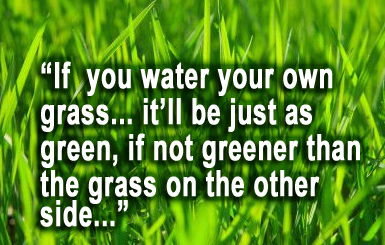 Are you so fixated on "the green grass on the other side of the fence," that you've somehow neglected to maintenance your own? Do you spend countless hours focusing on what others are doing to reach their goals? During these times, do you ever feel like they (whoever they is for you) must know something you don't know? Do you have intense feelings of incompetence or ineptitude that immobilize you and keep you from acting on your own convictions? If so, this post is specially written for you! God is nudging you today to stop looking over the fence and begin working YOUR vision right in your own yard. You have too much inside of you to allow any obstacle, perceived or real, to stop your progress. No matter how challenging things are, God has already placed the wisdom and raw talent in you to get the job done. But you'll never know that, if you don't begin making strides. All you need to do is take it one day at a time. See, it's very easy to unwittingly become a passive observer in life... a perpetual researcher... thinker... dreamer... but never a doer. At some point, however, you've got to stop observing and begin doing something. Start anywhere, as long as you start somewhere. Whatever your goals may be, it's time out for focusing on what you don't have... don't know... don't understand... and begin moving toward the realization of your divine destiny. After all, there will ALWAYS be more to learn. Even after years of working in your field, sharpening your knowledge, and honing your skills, there will be more to discover. Albeit, in the meantime, you can't allow what you don't know to inhibit you. Although you don't know EVERYTHING, you know ENOUGH to get started. And all God ever asks is that we do our best--nothing more, nothing less. So get out there and begin making it happen; trust me, you'll pick up more knowledge along the way than you ever thought possible. But you surely won't learn anything simply by wishing, hoping, and pontificating. Philosophizing and pondering new ideas is meaningless, if you don't ever bring those ideas into focus and start acting on them. You can't spend all your time in the "think tank." You've got to be willing to get up and get moving. Listen. Some abilities never manifest until you're put in a situation where you HAVE to tap into them. You learn by doing. I cannot stress that enough. You become an expert at whatever your craft is, by actually operating in it. The more you do... the better you become. On the other hand, if you never get started, you'll never improve. You'll continue to be stagnant and eventually the skills you do have will deteriorate. What God has invested in you is meant to be put to use and enhanced... not buried. (See Matthew 25:14-28) Until you act on the vision He's planted inside of you, you'll remain in a constant state of discouragement, dis-ease, and dissatisfaction; that restlessness is the Lord's way of pushing you out of your comfort zone and into the next dimension of productivity and blessing. What are you waiting for? Start working your vision, and do it today!